Magnetite and haematite both commonly give good decrepigrams and decrepitation is particularly useful to investigate these opaque minerals. Magnetite and haematite are often considered to be homogenous materials, but the decrepitation method reveals them to be quite variable. These variations can be used as an exploration tool and have also provided insight into the genesis of these deposits. At the Tennant Creek mines, Au and Cu occur within massive magnetite/haematite/chlorite hosts, there being little or no quartz present. 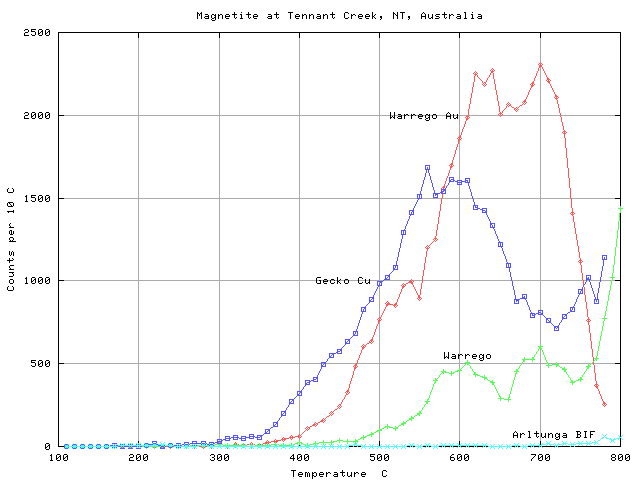 Intense decrepigrams are produced by both magnetite and haematite samples shown in the following 2 figures. 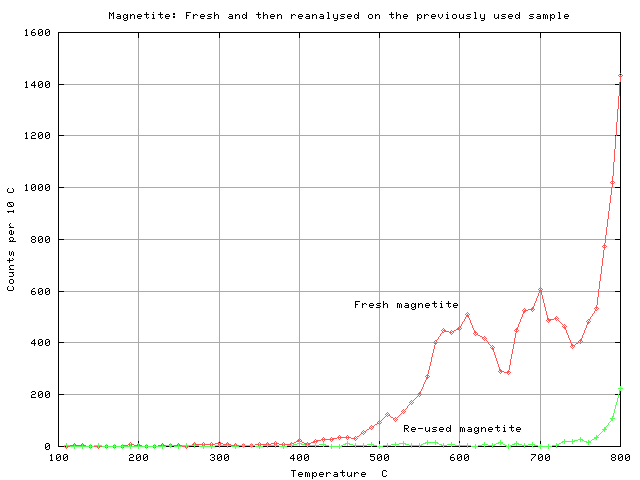 For comparison, magnetite from the same BIF formation at Arltunga, some 500km away was analysed. This sample gave no decrepitation and it is inferred from this that the Tennant Creek deposits are hydrothermal rather than of sedimentary origin, counter to other widely adopted genetic models. In addition, the decrepitation of haematite suggests that this is a primary phase and not simply a weathering product derived from the magnetite as that would have destroyed any fluid inclusions. 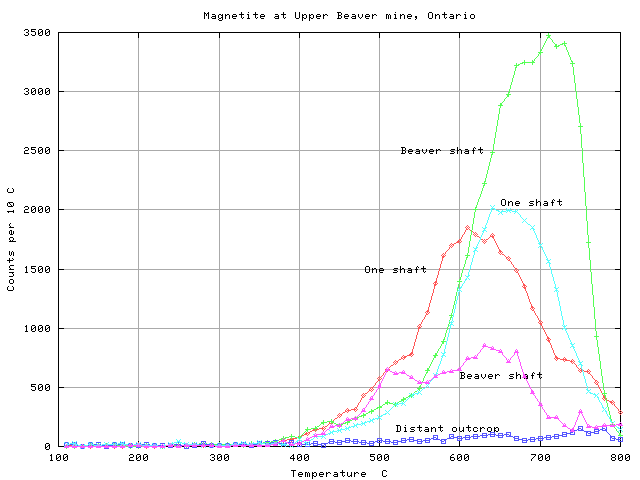 Similar mineralization to that at Tennant Creek occurs at the Upper Beaver mine, Ontario with Au in massive magnetite. 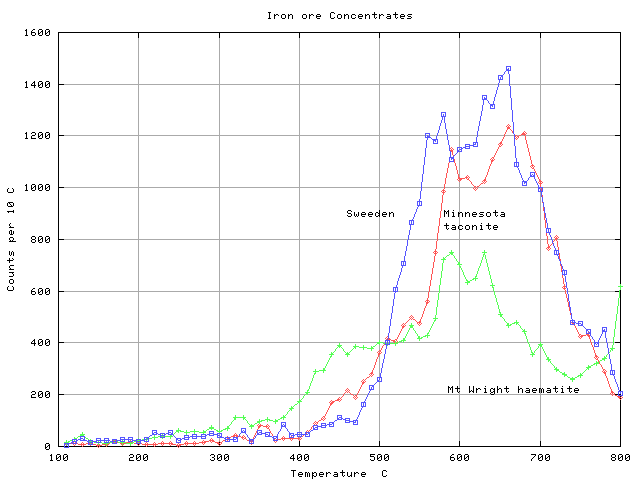 Magnetite samples from 2 close mine shafts show strong decrepitation with substantial temperature variations. Samples from a bulldozer cut some 300m away gave no decrepitation and the results can be used to discriminate between potentially mineralized and barren magnetite. Lyon magnetite skarn, Nevada, USA. 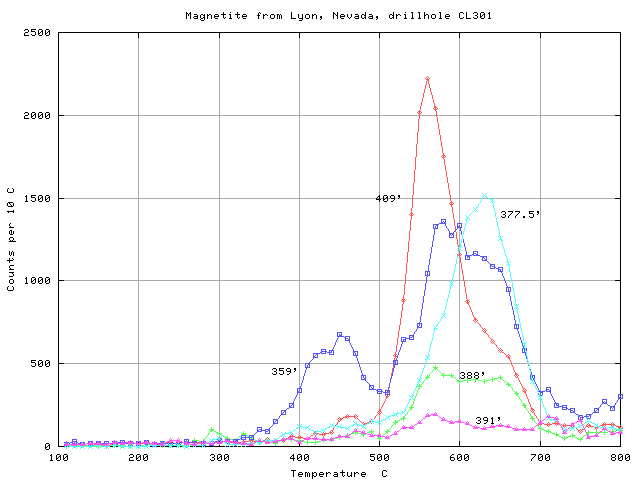 The Lyon deposit in Nevada is a magnetite skarn with low grade Cu and Au mineralization. Samples of magnetite from one of the exploration drillholes show widely varying decrepitation. This complexity within the magnetite is not apparent either from the core logging or chemical analyses. 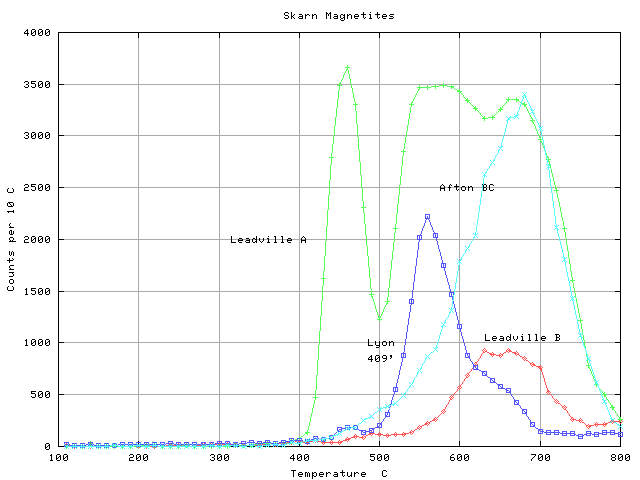 Other magnetite skarns at Leadville, Colorado and Afton, British Columbia similarly show strong decrepitation in magnetite samples. 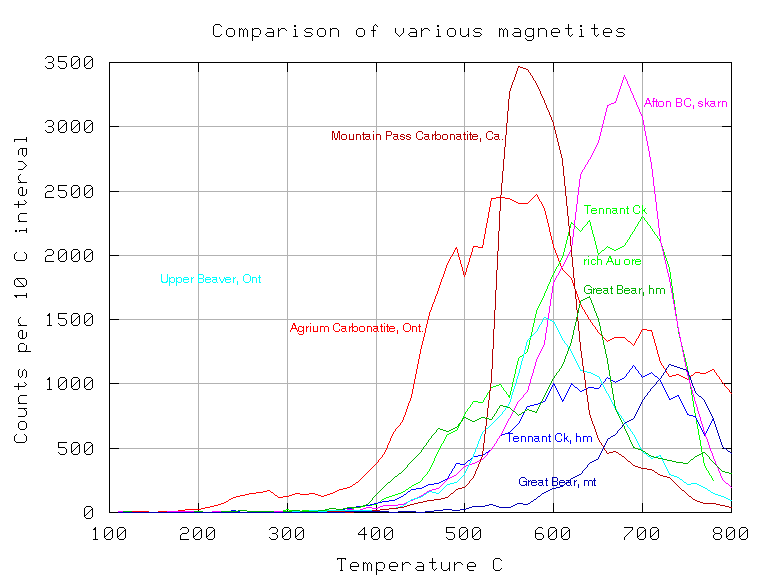 Magnetite samples show a great range of variability, which can be used to discriminate between different types of magnetite and also to discern zonation within individual magnetite bodies. 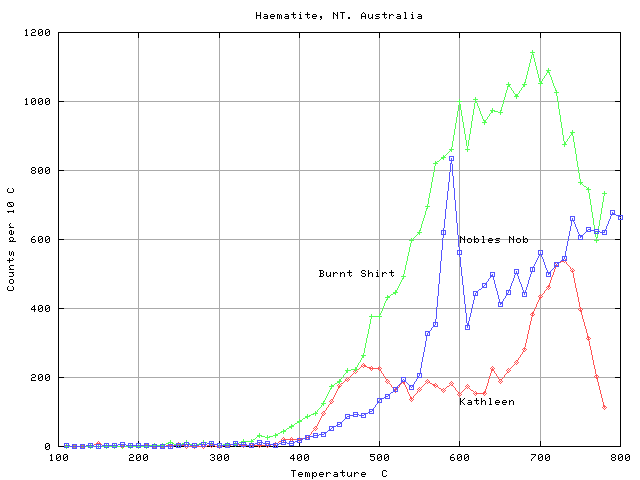 Note that the carbonatite samples show unusually low decrepitation temperatures, and the auriferous magnetites sampled to date frequently have higher decrepitation temperatures, with decrepitation peaks being near 650o C.
Concentrates used in the steelmaking industry have also been analysed and decrepitation is being evaluated as a means of quality control of ore feed to concentrating plants. To confirm that the decrepitation sounds measured are not merely mechanical noises, this magnetite sample was analysed twice in succession. The second analysis (green) gave only background counts with a few counts from inclusions which just survived the first analysis at the 800 C cutoff temperature. This confirms that the counts being measured are the result of an irreversible phenomenae, such as inclusion decrepitation, rather than thermal expansion noises - which would be present in both analyses.